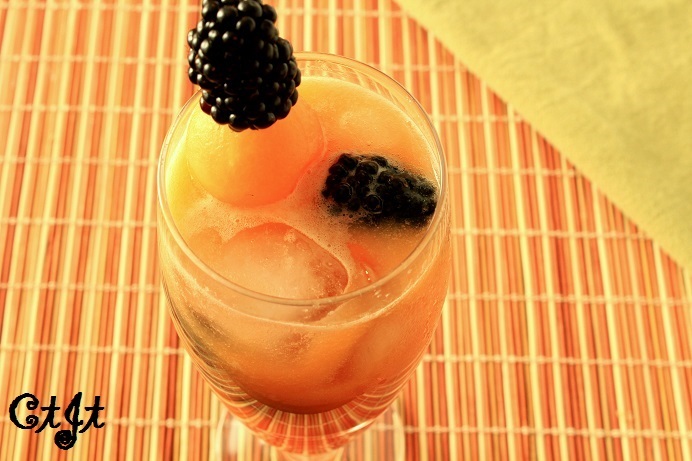 This fresh beverage will cool you down on a hot day, for sure. It’s simple to make, yet more impressive than regular juice. Inspired by MarthaStewart.com. Serves about 10. 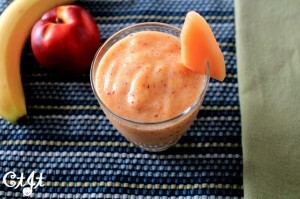 Directions: Working in batches, puree melon in a food processor or blender until smooth. Position a fine-mesh sieve (or a cheesecloth/thin kitchen towel) over a pitcher or large bowl and pour the pureed melon through the sieve, pressing on solids the solids to squeeze out as much juice as possible. You should have about 4 cups juice. Add the lime juice and 3-4 cups of water (give it a taste test before adding all 4 cups) to the melon juice and stir well. Chill for about an hour. 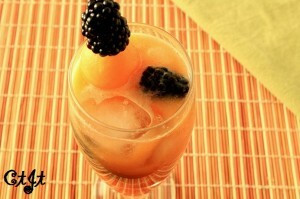 To serve, add ice and 2 cups of berries. Garnish with mint leaves and/or melon ball skewers. Cook’s note: Some agua fresca recipes call for sugar to add a little sweetness. I think this is sweet enough as it is, but add some if desired. 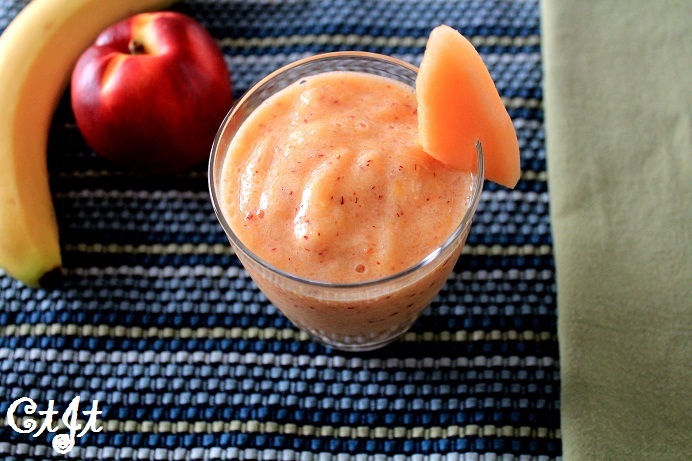 You can mix in any fruit you’d like to this smoothie, such as strawberries, to add a new flavor or as a substitute for another. Serves 1-2. Directions: Add all prepared ingredients to a blender and blend until smooth. Serve immediately. Melon and prosciutto is a classic Italian pairing. I love the salty-sweet combination, especially when drizzled with our reduced fig balsamic. It presents just the right flavor…delicious! I have two time-saving tips for this dish: 1). Balling melon takes time (and a bit of skill) so feel free to cube instead of ball the melon. 2). If you don’t want to take the time to make skewers, simply arrange the ingredients in a nice pattern on a large serving tray and allow guests to use toothpicks to skewer up the treat themselves. Makes about 9 skewers. Directions: Add the balsamic to a small sauté or sauce pan. Bring to a light boil then reduce heat to a simmer. Cook, stirring occasionally, until reduced by half and it has thickened, becoming more syrup-like. About 10 minutes. 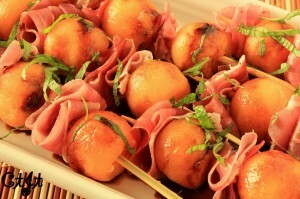 Skewer on the melon and prosciutto (weaving on the prosciutto), alternating pieces, to fill a skewer. You’ll use about three pieces of melon and three pieces of prosciutto for each skewer. Repeat until all ingredients are used. Place finished skewers in a line on a cookie sheet. Drizzle the completed skewers with the balsamic reduction. Arrange on a platter, either stacked in a pyramid or in a single layer in a circle pattern and sprinkle with the mint, if using. Serve. The peppery arugula pairs well with the sweet melon and delicate shrimp. Wild arugula packs even more of a punch, so use what your taste buds desire. If you can’t find wild, regular or baby will be just as good. Recipe adapted from How to Pick a Peach by Russ Parsons. Serves 6. Directions: In a saucepan over high heat, bring the water, wine, vinegar, salt, red pepper flakes and shallots to a light boil. When boiling, add the shrimp. As soon as it begins to boil again, cover it tightly and turn off the heat. When the pan is cool enough, put it in the fridge. Strain the shrimp cooking liquid. Place 2 TBL of it in a small, lidded jar and discard the rest. Add the Meyer lemon olive oil and shake well to make a smooth, thick dressing. Season with salt & pepper, and add a bit of fresh lemon juice if needed, to taste. Put the melon in a bowl and add enough dressing to coat lightly (1 to 2 TBL). Toss gently, remove and arrange a single layer on a serving platter. Add the arugula to the bowl and add enough dressing to coat lightly (1 to 2 TBL). Toss and arrange on top of the melon. Repeat with the shrimp and arrange on top of the arugula. Serve immediately, with lemon wedges.